Billionaires like Frank Giustra don't waste their time on dead-end projects. So the fact that Giustra is backing Hive Blockchain Technologies Ltd. (OTC: HVBTF), a Bitcoin stock focused on cryptocurrency mining, tells us this company has tons of potential. My research shows shares will at least double over the next 12 months. "My primary goal and only concern is building the value of the company," Giustra told Tommy Humphreys on a post on CEO.CA. 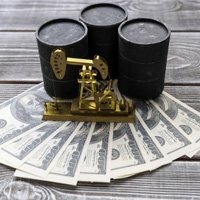 "This is typically a three- to five-year exercise and the daily share price does its thing in the meantime." A native of Canada, Giustra is known mainly for his successes in the precious metals mining and entertainment businesses. Giustra's financial wizardry helped turn junior miner Wheaton River Minerals into a powerhouse that Goldcorp Inc. (NYSE: GG) acquired in 2005. A worker at a Genesis Mining facility works on a mining rig. In 1997 he founded film and television company Lions Gate Entertainment Corp. (NYSE: LGF.A, LGF.B). Today Frank Giustra is chair of Leagold Mining as well as president and CEO of private equity firm Fiore Group. But he isn't the only notable person associated with the Hive Blockchain project. Frank Holmes, chief investment officer at U.S. Global Investors Inc. (Nasdaq: GROW), a leading mutual fund and asset-management firm, serves as chair of the company. Meanwhile, the largest shareholder in Hive Blockchain Technologies is Genesis Mining, the biggest cloud-crypto miner in the world. Genesis also operates the data centers in Iceland and Sweden where the mining takes place. It's an impressive lineup for a company with a micro-cap valuation of just $277 million and a share price that sits in penny stock territory ($0.85 on the U.S. OTC market). Hive has carefully planned its strategy to become a global leader in crypto mining. It intends to focus initially on mining Ethereum and Bitcoin, the No. 1 and No. 2 cryptocurrencies, although it expects to add others. Hive has several advantages over potential rivals. Genesis Mining brings five years of Bitcoin mining experience to the project and knows how to squeeze the most profits from a mining operation. The factors a miner can control are the availability of cheap electricity, the cost of the mining equipment, the energy efficiency of the hardware, and how well it can manage its operation. Genesis has developed proprietary software to manage its big mining farms, which it uses in the Hive facilities. This software automates much of the mining operation, saving money and extracting the most from the hardware. Genesis chose Iceland and Sweden because both offer very cheap electricity. Their cool climates also reduce the costs of artificially cooling the mining rigs, which generate a lot of heat. 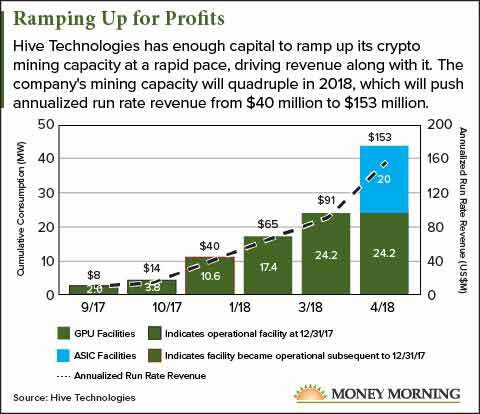 Genesis builds its own mining rigs using off-the-shelf parts and GPUs (the graphics processors that do the actual mining) from companies like Advanced Micro Devices Inc. (Nasdaq: AMD) and Nvidia Corp. (Nasdaq: NVDA). Hive never had an IPO, instead gaining access to the public markets by executing a reverse takeover of Leeta Gold Corp. last September. It's a common maneuver among penny stocks. That move, the deal with Genesis, the purchase of 17 million shares by Holmes' U.S. Global Investor, and the relationship with Giustra allowed Hive to raise $147 million of growth capital in its first full quarter of operation. With prominent investors already backing Hive, raising capital as needed should not be a problem. And as a well-capitalized operation, Hive can do whatever it takes to get the high volume of GPUs its needs as quickly as possible (the sooner you get a GPU online, the sooner it can make money for you). That includes leasing Boeing 747s to transport the GPUs directly from the factories to the mining facilities. It also means Hive can scale its operations very quickly. The company launched with just 2 megawatts of mining capacity last year. It's already expanded that to 24.2 megawatts and plans to nearly double that to 44.2 megawatts by September. It has already purchased more property in Norway for future expansion. The rapid expansion of capacity means the annualized run rate of Hive's revenue will have grown from $8 million at launch to $153 million in the company's first year. And unlike many new companies, Hive has proven itself profitable – if only barely. In its first quarter of operation, it made $149,724. While this Bitcoin stock is obviously high-risk because of its exposure to the volatile cryptocurrency sector, that level of risk also has the potential to deliver huge returns.